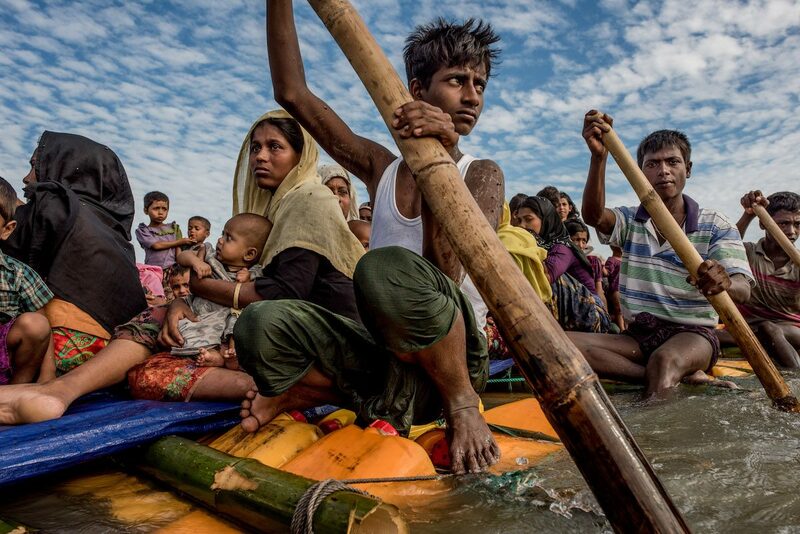 In December 2017, The New York Times published “How 655,000 Rohingya Escaped,” a visual experience composed of photos, videos and maps revealing the journey of Rohingya Muslims’ exile from Myanmar. This ethnic minority group has faced discriminatory policies in Myanmar since the 1970s and, in 2017, an a surge of violence against the Rohingya people motivated thousands to flee to Bangladesh. 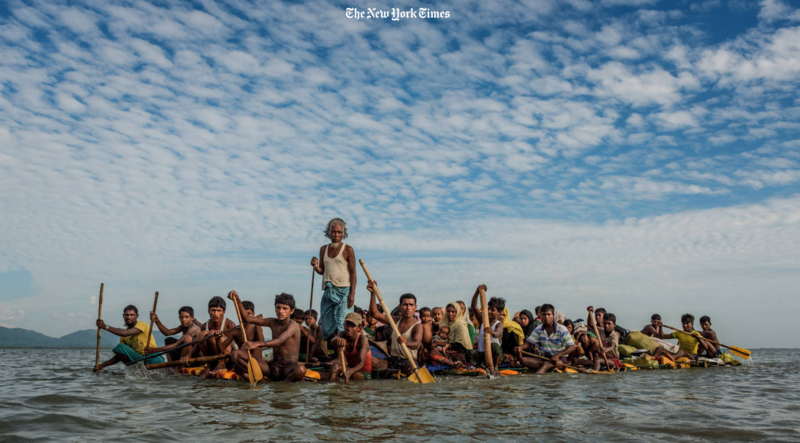 Tomás Munita, one of the photographers on The New York Times project, spent two months in Bangladesh taking photos of Rohingya in refugee camps. Storybench spoke with Munita about his experiences in Bangladesh and how he went about taking pictures of the refugees. Credit: Tomas Munita for The New York Times. What stands out to you now about your experience in Myanmar? Obviously what is happening is very tragic. 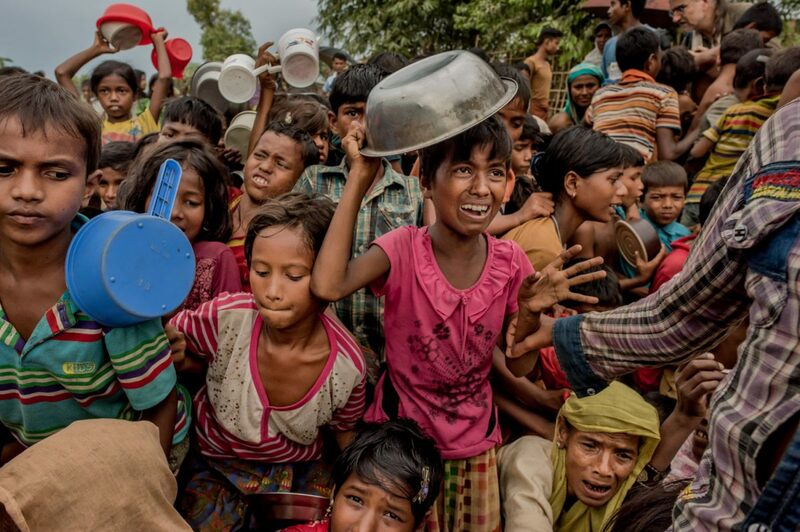 This humanitarian crisis was a buildup of racism, anger, and hatred in Myanmar. There was so much hate, fear, misinformation, and brainwashing happening in Myanmar against Muslims that we were almost expecting this to happen. What stood out to me is that hatred is something that is part of humanity. We’re not free from hatred, it can happen anywhere to anyone. Maybe we thought that these kinds of situations or this level of unfairness was over, but racism and hatred is still happening, all it needs is the circumstances to cook for awhile and it will happen. There wasn’t really any inspiration. I was just documenting. It wasn’t about me. My job was to be witness to what was going on, to talk people and hear about what they’ve seen, and what they were escaping from. I can’t say I got inspired. The only inspiring thing is witnessing how the best of people comes out in the worst moments. The Rohingya are open, welcoming, and beautiful people. To see how the Rohingya take care of each other, how parents and children love and try to protect each other, that is to me is the most inspiring aspect of this project. What do readers gain with visual storytelling as opposed to a traditional long-form piece? What these people were experiencing is hard to put it in words. Or at least, in words it could read as too much information. It’s important to let people see other people’s lives and their suffering, and photography can help bring these emotions to the readers. Photography is a different language. 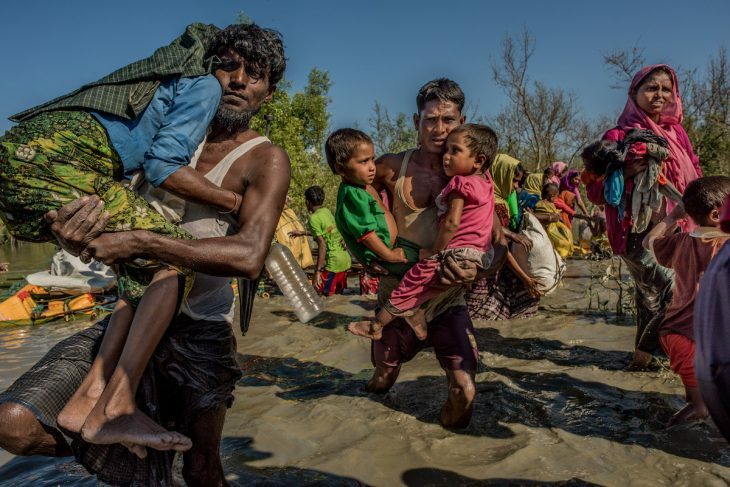 The photographer is just there to let the Rohingya people communicate their own stories, to just let them show who they are, what they feel, what they see, and what they’re experiencing in life. How did you choose your sources? Were some people afraid to talk to you or have their photos taken? Yes, many people were afraid, especially if they still had relatives living in Myanmar. But because they were in Bangladesh, most told their stories openly and gave their names. As a photographer, I look for characters, not sources. When I was taking portraits, I was interested in finding people where I could physically see their suffering. A woman can tell you that she was raped, her husband was killed, or her children were shot, but that’s something you can put in the caption. It’s different when you see the scars in her head from when the army tried to kill her with a machete. So, it’s important to have the visual scars to show what they have been through. What ethical decisions were made behind the scenes? I talked to some people who understand psychology and post-traumatic stress disorder. You have to be very careful when talking to victims. If I talk to a child or a woman, I don’t want to make them cry for the picture. I don’t want to make them suffer for telling me their story. You have to be cautious about reviving wounds. If I think it’s okay to ask questions or I need certain information, I’ll be very careful when asking difficult questions. Otherwise, photographing is completely open. If there’s a funeral for a child, I’ll ask for permission and photograph the dead body of the child. I try to be careful. I don’t want to evoke the wrong reaction from the reader. I look for tenderness, I want love in that image, not an uncomfortable feeling. I want the image to be respectful of the family and the child. What difficulties did you encounter while reporting? The main thing is having to see this, having to see what’s going on. It’s not easy. Then, it’s a big territory and you don’t always know what’s going on. Sometimes you hear about 2,000 people traveling around the border or that boats are arriving, but you don’t know how to get there and you have to try to find the place. This is something that takes a lot of time and sometimes you are successful, but other times you miss people’s arrival. Another difficulty was that after several weeks, the army tried to control the press and what we photographed. Locals, like mayors, were not happy with the sudden influx of Rohingya in their territory and they wanted to control where we would go, which was a major concern to work around. A smaller level of difficulty is when you are taking pictures in the camp, you’ll have lots of children following you and trying to have fun with you. For a photographer, this is a challenge. You cannot take photos when children are running around and standing in front of you to be in your images. It sounds ridiculous, but it is a real challenge to take natural photos, to try to get exactly what you see before the arrival of your camera. Situations change when photographers arrive, because people are interested in the camera. What I want to capture is exactly what is really happening, I just want to photograph real life. For example, if I see a family cooking dinner and go in their home to take pictures, then you’ll have lots of neighbors coming to ask what is going on. So as a photographer, I have to let things settle down to what it is was before I arrived. Things have to go back to normality and that takes time and patience. Everything has to be perfectly real, nothing should change because of the photographer’s presence. Children struggle to enter a center where hot meals are distributed daily in Palongkali refugee camp. Credit: Tomas Munita. When do you know that this is a moment you want to capture? Photography is all visual. I walked around all day and I looked for situations, for composition, for color, for emotions, for characters. Sometimes, things just happen in the moment. Sometimes, I went looking for funerals or for wounded people. When I get to that place, I just document everything I see. I try to find composition. I try to find where the light hits. I pay attention to what people are expressing, if they are looking left or right. It’s a process, it’s not just I see something and I take a picture. I put myself into a situation that I want to photograph and then I start photographing. I can take hundreds of pictures, it’s not just one. Do you have a story in mind when you photograph? It depends on what is going on. A couple days, there were more arrivals coming on rafts. When those people got close enough, I just started taking pictures. Some other times, there’s nothing specific happening, so I would just go around the camp and photograph. I would meet people and talk to them to understand new things. For example, you might see an old woman being taken to the doctor or find a local doctor who is overwhelmed with people, and that situation can become the day’s story. But it’s the atmosphere that’s important to me. It’s the images where you are able to get into people’s lives that really matters. The picture has to carry some level of beauty and be subtly evocative of what their suffering is and who these people are. I noticed you have photos from your time in Bangladesh on Instagram, are those photos that didn’t make it to publication? Some of them, yes. When I make a selection, I pay attention to the photos that I think are powerful enough. When they make it to an editor, it’s not just a selection of the best images, there has to be narrative, a logical order to the photos. So sometimes, really good photos will not fit in the story; for different reasons, maybe because there’s another photo that says something similar. So the photos I use on Instagram or on my website are images that are still powerful, but didn’t follow the chosen narrative. What message did you hope to get across with the photos? I want people to know what’s going on. I want them to have some level of emotional connection to the story. I don’t want it to be just information, I want the photos to provoke something. There was an obvious need, there are thousands of Rohingya people who cannot work anymore, they desperately need food, they need shelter, they need medical facilities, they need everything. If you read in the newspaper 655,000 people are living in these conditions, it’s not enough. That’s why I choose images as my language because it appeals to emotions.